2 Wives 2 Mums: One dress down, one to go! One dress down, one to go! Today I (S) got my wedding dress! It was my third experience of trying on wedding dresses, all of which have been very different, so I am using this post to give anyone buying a wedding dress some insight, and to remember the experience myself! The first dress I tried on was at a wedding fair. I have described this in more depth here, but to summarise, this is most people's first experience of seeing actual wedding dresses. Wedding fairs (especially the one we went to, the largest in the country) are busy, hectic places full of brides and their friends/mums/bridesmaids wanting to see everything, and vendors wanting to sell brides everything! When wedding dresses are hung up in their hundreds, in rows and rows, as they are at fairs, its completely overwhelming. They all look like long, white dresses - how on earth do you pick one out?! They often have catwalk shows which can give you an idea of how the dresses look on various shapes and sizes (although, they are models, so there unfortunately isn't THAT much deviation in shape and size!) Some dresses are displayed on mannequins, and it was on a mannequin that a dress caught my eye. I asked an assistant if I could try it on, but the experience was less than enjoyable! I was in a tiny cubicle with a rushing assistant who told me not to bother removing my leggings or boots, in order to see the dress you have to walk out in from of everyone else at the fair, quickly see yourself in front of a mirror, and then quickly rushed back into the cubicle, with the next girl being ushered in before I had finished getting dressed. The idea of wedding fairs, for vendors at least, is the hard sell, there is no time for dreaming of yourself walking down the aisle and what your other half would think of you.... I did love the dress, but did not want to purchase it feeling so rushed, or not having anything to compare it to. The second trying on of a dress was at a discount bridal store. This is kind of a middle ground I guess. I was in a store, and as you need an appointment to visit a bridal store I was the only customer. I was told to look at the dresses hanging up, and pick out any I wanted to try. But if I'm honest, when I looked along the fairly small rail there weren't really any I wanted to try on. However, as both my parents had booked the day off work to take me to the store, and had picked me up and driven me there,I felt I should at least try some of the dresses on. None of the dresses were what I had imagined myself wearing - they all seemed too big, bulky and heavy for me (I'm a size 10 and 5foot1!) But my Dad picked two out (surprisingly the two he picked were the best two in the store!) and I tried them on. I pretty much knew neither of them were going to be The One for me before I tried them on, but tried to keep an open mind. My parents loved both the dresses, but I feel this may have had more to do with the fact I was wearing a big white wedding dress and a veil. I am glad we went for this reason - it was lovely to see both my parents so happy about being with their daughter as she tried wedding dresses on, its a momentous occasion for anyone and I'm glad I have supportive parents who were so happy to be there with me. There was nothing wrong with either dress, they were both beautiful, but they didn't give me that 'this is the one' feeling. I wouldn't discourage anyone from trying discount stores for their dress, if you find the dress of your dreams then they come in a lot cheaper than regular bridal shops. But even so, wedding dresses are expensive - even the ones I tried on in this discount store were £400 each - thats a lot of money, and you have to know without doubt that it is the dress for you. If you go without your heart set on a certain style, and find something you like, they are great. They may not have all the extras (they provide heels and veils to try with the dress, but the smallest heels were a 5 and I'm a 3, and the veils were all one length.) but you could save quite a bit of money. My third (and final!) dress shopping experience, was at a bridal store about 45mins drive from our house. I've spent quite a few hours looking at wedding dresses since our engagement, searching for the perfect one, and it seems a lot of the dresses I have liked have been by the same designer, and a lot of the dresses I liked were stocked by the same shop. As my parents were both working, I was accompanied by L's mum, whilst L and her dad went for coffee. L's mum and I are both very shy around new people, and it took me a while to feel relaxed around her, but I adore her now, and am so glad I get such a lovely mother in law! This was also a lovely bonding experience I felt; she very much enjoys being included in the planning of our day, so it was great to go dress shopping with her. The assistant in the store was lovely, and made me feel like I was chatting to a friend about my wedding, rather than being sold a product by someone who didn't care. I had asked to try on three dresses from the line I liked, but she could only find two. Weddings stores will usually be able to order in dresses they don't have (usually for a small redeemable payment), which she advised me I could do. I also picked another two dresses out from the rails in the store. The first dress I tried on was one of the ones I had requested. The dress was lovely, although L's mum wasn't too sure about some of the detailing, and I felt it may have been a bit bulky for my frame. Again, there was nothing really wrong with it, it just wasn't for me. 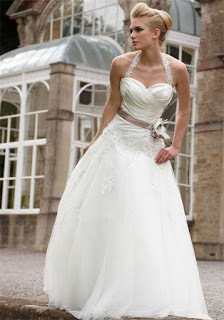 The second dress I tried on, was oddly enough, the first dress I tried on, the one at the wedding fair. It felt completely different to every other dress I had tried on, instantly it just felt like mine. Its the dress I have compared every other dress to. My boss used to run a bridal store and told me that you know when you've found your dress, there is no 'it's lovely but I'm not sure'. As soon as I saw the dress on, I wasn't interested in trying on the other dresses I'd picked, I loved it and I didn't want to take it off! The only problem was, the price was out of mine and my parents budget, and I knew there was no way I could afford it full price. So I asked if I could I have a discount (quite a large one actually - you don't get if you don't ask, right?! ), if I paid a deposit there and then. The assistant looked unsure and said she would have to ask the store's owner, but luckily he agreed 'as it's Christmas'. I'm so glad I asked! I am so excited to have my dress! I can't describe it as we are not seeing each others dresses until we walk down the aisle, but it's simple whilst being very pretty and girly, not particularly 'on trend' but the assistant described it as being 'so romantic looking' <3 They will order my dress in to store, which takes about six weeks, and then I have to go back in February with the shoes and underwear I will be wearing on my big day, to have measurements taken, so that alterations can be made. Altogether they recommend getting your dress six months before the big day, in case of delays in getting the dress to store, and then to allow plenty of time for alterations. I can't wait for L to have the same moment when she looks in the mirror and sees her dream dress looking back at her, and more than that, I can't wait for the moment we see each other in our dresses for the first time. Aww I can just feel your happiness and excitement exuding from this post! It's so brilliant to hear you've had a good experience and cannot wait to see pics of your dress after the wedding! Awww yay! This is so exciting and makes me so happy for you girls! I can not wait until Meaghn & I are able to have the same opportunity! You girls are going to be gorgeous and I can not wait for your big day! Very nice post. I just stumbled upon your weblog and wished to say that I've truly enjoyed surfing around your blog posts. After all I will be subscribing to your feed and I hope you write again very soon!